Expanding Atelier Ten’s leadership in the U.S., Ben Shepherd and Shanta Tucker join Claire Maxfield and Nico Kienzl as directors. 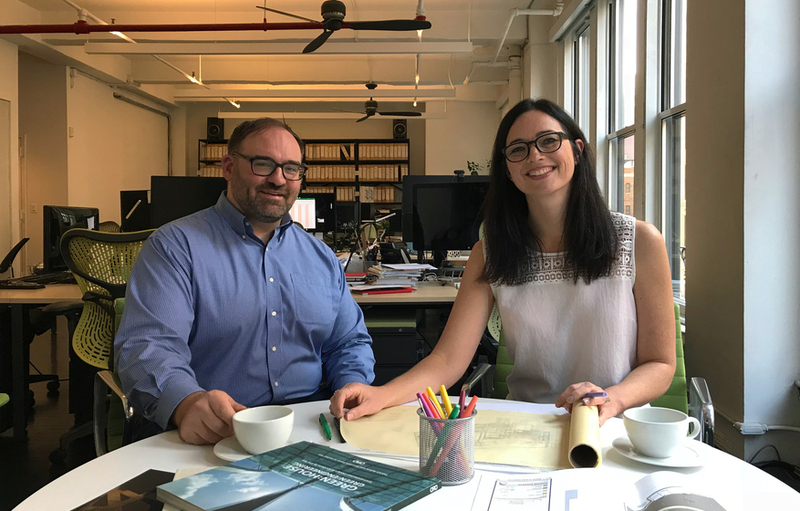 As of July 2017, Ben Shepherd and Shanta Tucker of the Atelier Ten New York office, are promoted to directors. They joined Claire Maxfield and Nico Kienzl in leading Atelier Ten to continue shaping a more sustainable built environment for the world. Ben and Shanta are recognized for their expertise and leadership in sustainable building design and construction. Ben has been a member of the Atelier Ten New York team since 2006. He has 14 years of experience in sustainability consulting, masterplanning, urban ecology, renewable energy systems and green development assessments. At Atelier Ten, Ben has consulted on more than 100 high-performance building and planning projects, including one of the first outpatient facilities to achieve LEED for Healthcare certification in New York City and a comprehensive environmental framework for Harvard Business School. He serves as the leader of Atelier Ten’s planning practice and has been instrumental in the advancement of the practice’s technical expertise and the expansion of the firm’s masterplanning profile. Ben is a proud recipient of the ENR New York’s Top 20 Under 40 Award, which celebrates the excellence of young professionals who represent the “Best-of-the-Best” in the construction and design field. He is a member of the University Development and Innovation Council at Urban Land Institute (ULI). His dedication and enthusiasm to sustainable masterplanning and buildings and his attention to the wellness of people and the built environment have provided a unique, cutting edge perspective to all projects throughout his career. Shanta joined Atelier Ten’s New York office in 2005, having worked for several years as a design mechanical engineer working on institutional, transportation, and laboratory projects. Shanta built upon her experience in engineering and HVAC design to develop, manage, and expand Atelier Ten’s energy analysis practice to include building simulation and analysis techniques for optimizing energy efficiency of high-performance building envelope, mechanical, and renewable energy systems. She also has managed many of the firm’s most ambitious projects, including the LEED Platinum Kroon Hall at Yale University, the Museo del Acero Horno 3 in Monterrey, Mexico, the LEED-Platinum Tour Carpe Diem in Paris, and a high-profile corporate headquarters in Brazil. Shanta’s leadership outside Atelier Ten includes several presentations, publications and lectures (national and international) on building analysis and high-performance building. She is an active member of the ASHRAE Publication and Education Council, ASHRAE Building EQ Committee, past president for the International Building Performance Simulation – USA Affiliate and she teaches at Columbia Graduate School of Architecture, Planning and Preservation (GSAPP) at Columbia University. Read Shanta’s and Ben’s resumes.